The gods became frightened by the flood, so they departed, went up to the Heaven of Anu. It is logical that gods escaping the flood would move as far away from the earth’s surface as possible, so the Heaven of Anu should be the most distant heaven from the earth’s surface, the highest level of heaven. But if one can’t apply the cosmic ocean to the Genesis text, perhaps the solid raqia (firmament) may anyway survive, because Horowitz describes how the heavens are made of particular stones in the cuneiform texts. The middle heaven is paved with opaque blue lapis lazuli, hiding the Igigi gods from view, and also hiding the highest heaven of Anu, which for some reason is paved with a red kind of stone. 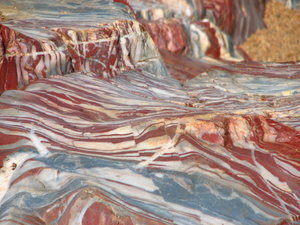 The lowest heaven is of “jasper”, whose colour and opacity apparently vary (in unknown manner) to allow a view of the blue sky. The tradition of stone heavens may derive from an observation that certain heavenly objects were the same color as minerals. For instance, Sirius shines like copper in the inscriptions of Tiglath-Pileser I (AKA 140:15). And a shooting star is said to shine like zaginduru (lapis or lapis-colored glass) in astronomical omens (S. Langdon, Rabyl. 7 233:20-21). The identification of astronomical bodies with stones, although probably originally based simply on color, may have lead to a tradition that the heavens themselves were composed of stone. The current evidence simply does not allow us to know, for instance, if ancient readers of Gilgamesh really believed that they too could have visited Utnapishtim by sailing across the cosmic sea and “the waters of death”; or if a few, many, most, or all ancient readers understood the topographical material in Gilg. IX-X in metaphysical or mystical terms. Although full geographies of the high heavens are not available much is known about these heavens from Akkadian texts, such as the fact that these heavens include gates, divine homes, and in Nergal and Ereskigal, a courtyard. Furthermore, the stone heavens are not the only model that the texts provide. Horowitz cites a tablet that gives a learned etymology of the word for heaven, šamȗ, that it derives from “water”, of which the heavens were made. This explanation reflects a tradition that the heavens were fashioned from water. In Ee IV 137-46, for example, Marduk fashions the heavens from the watery corpse of Tiamat. Another connection between the name of heaven and water is that a singular homonym šamȗ (šamȗm with mimation) means ‘rain’. Akkadian šamȗ, unlike Sumerian an, is a plural noun. The name is a cognate of the most common names for heaven in other Semitic languages, including Arabic (šama’u), Aramaic (šemaya), and Hebrew (šamayim). Notice that etymologically the Hebrew shemayim, “heavens”, the proper name of the raqia, is therefore derived from “water”. They are made of water, rather than keeping out water by being made of metal or stone. The visible heavens were thought to be circular in shape, since the clear sky appears to be a giant circle. Textual evidence for this belief is found in the terms “circle [kippat] of the sky” and “circle [kippat] of heaven”. Notice such terms are used in the Hebrew Bible too. Further evidence for the circular shape of the sky may be found in the circular shape of Assyrian planispheres, the circle enclosing the winds in BagM Beih. 2 no. 98, and the terms “circle of the winds” and “circle of the four winds”. Although the clear sky seems to us to be shaped like a dome, rather than a flat circle, there is no direct evidence that ancient Mesopotamians thought the visible heavens to be a dome. Akkadian kippatu are always flat, circular objects such as geometric circles or hoops, rather than three dimensional domes. Nonetheless, evidence for dome-shaped, or curved, heavens may be found in the ZK/ptt-star text BM 38693+, the blessing formula STT 340:12, and AO 6478, where the Path of Enlil is 364° long. All three imply that the Path of Enlil, at least, is a curved band that encircles the earths surface. However, this does not prove that the surface of heaven is curved, since stars need not have necessarily traveled along the surface of the sky. There is also no direct evidence for the shape of the high unseen heavens, although it is likely that these levels too were thought to be circles. A cryptic reference to the possible circular shape of the Heaven of Anu may be found in a su.il a where the Heaven of Anu is identified with a nignakku ‘censer’ (Ebcling Handerhebung 14:16). Censers were flat, round objects. A number of texts refer to cosmic bonds, including ‘bonds’ (riksu, markasa), lead-ropes (serretu) and the durmdhu (great bond); which secure the heavens in place. The most complete explanation of how the heavens are secured is found in Ee V 59-62. Here Marduk twists Tiamats tail into the durmadhu, and uses this durmadhu to keep the heavens in place over the earth’s surface and Apsu. Then, Marduk uses Tiamat’s crotch as a wedge to hoist the heavens upwards and keep the heavens from falling. 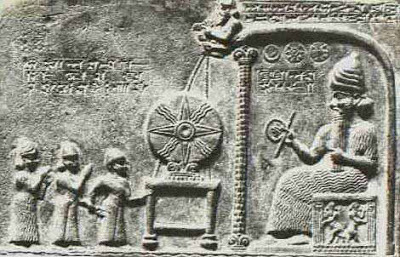 Later in Ee V 65-68, Marduk secures the riksu ‘bonds’ of heaven and earth and fastens serretu ‘lead-ropes’, which he hands to Ea in the Apsu. These lead-ropes may be tethered to higher regions of the Universe, and Ea, the lord of the bottom region in Enuma Elish, may hold these lead-ropes to keep the higher regions from floating away. Although it is not certain how the apparatus described in Ee V looked when it was fully operational, it is likely that it had the appearance of a lattice of rope work, with the durmadhu as its central axis. This durmadhu may have been a thick reed bundle, since a “reed” durmahu is listed in Una VIII. The heavens, in other words, far from supporting the weight of a vast cosmic ocean, actually hang by lattices from some fixed point, and may even have to be held down and prevented from drifting away. We had something like that as a larder for camping, and it would neither have kept out water, nor held the tent up. In fact, these circular heavens seem to have been defined by the horizon, another parallel with some biblical texts. But the idea was that the base of heaven was not on the horizon, but above it, so that the heavenly bodies rose through the sky before entering the heavens proper through doors or gates. …The fact that an.úr and išid šamê include a band of heaven above the horizon is demonstrated by BBR 2 p. 102:101 and parallel passages, where išid same turns red at dawn before the Sun rises. 23 At this time of day, the lower part of the eastern sky above the horizon is tinged red by the approaching Sun. The heavens, in other words, approach earth at the horizon, but do not meet it. If there were a cosmic ocean, it would rush in from the sides and drown the world. That, I think, is enough to show that the so-called “ANE cosmology” doesn’t come from Mesopotamia. So does it come from the Bible? I would argue that there are enough parallels between what I’ve described and the biblical texts to suggest a similar shared phenomenology. The clearest difference is in the greater complexity of the Babylonian 3-heaven, 3-earth picture, necessitated in part by their polytheistic theology. The Bible pictures God as dwelling in the highest heaven (like Anu), but the middle heavens of the Igigi would serve no purpose. On one occasion only, when the elders of Israel ascend Sinai for a ritual meal with Yahweh in Ex. 24, beneath his feet is described “something like a pavement made of lapis lazuli, as it were as clear as the sky itself”. But this is visionary talk, rather like Ezekiel’s “appearance of the likeness of the glory of Yahweh”. As we’ve seen, even to the Babylonians stone heavens may have been metaphorical. The Bible also refers to freshwater springs rising from below the earth, and to Sheol as the place of the dead, but actually neither is elevated to the status of a true realm like the Mesopotamian apsu or the underworld. Instead they are simply aspects of the eretz, the earth that God has made, just as the heavens represent both the sky, and some realm where God dwells above the sky. The ocean seems to play the same role in both “cosmologies”, doing what the ocean does in our world by surrounding the land. I’ll round off a few details in a third post, but I think as far as Horowitz is concerned, the “goldfish bowl” ANE cosmology simply doesn’t hold water, any more than his suspended stone heavens would, or would even need to, given the absence of any trace of an infinite heavenly ocean in the Mesopotamian literature.